The Future is Here. It’s not Microsoft-based. Home » Blog » The Future is Here. It’s not Microsoft-based. 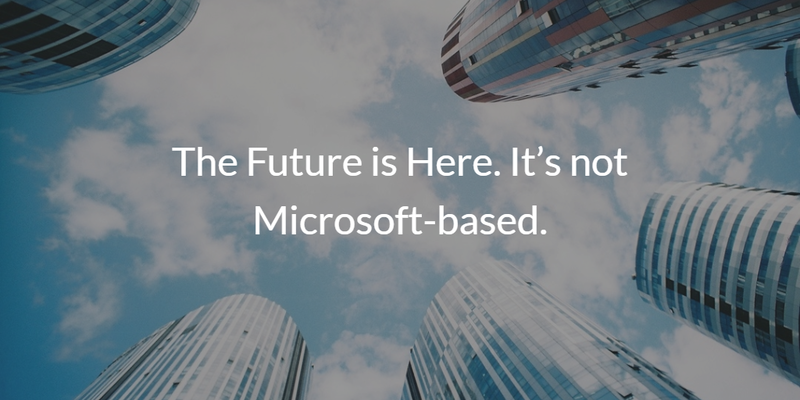 We all remember the days when an IT admin’s environment included Microsoft-controlled corporate domains, ethernet-connected workstations, and on-premises servers and applications. Virtually all of those resources were based on Microsoft Windows. In addition, you had all of the productivity stack of infrastructure and solutions. These included Microsoft Exchange, Active Directory®, Windows Server, Office, and much more. That worked well for a very long time and made Microsoft one of the largest companies in the world. But that’s not the future. Innovations in IT have revolutionized the single vendor IT infrastructure. The scary part of the Microsoft-centric IT network was that it was still complicated and difficult to maintain. The goal of today’s modern IT environment is to be far simpler and managed at a lower cost. Cross-platform, multi-provider, and cross-location IT landscapes are the norm today. End users are trading in their Windows laptops and desktops for Macbooks. And Linux is replacing Windows-based servers. The once-dominant Office productivity suite is morphing to be Office 365 or G Suite. On-prem applications are shifting to the cloud either from the same provider or new ones. The network is even changing from being wired to WiFi. Consequently, this means even the domain controller’s role is changing. With all of these significant changes, what are the implications for IT staffs around the world? Perhaps the most critical change is that IT will now need to embrace mixed-platform environments. The demands of meeting the needs of the business are far greater than the cries from IT for manageability. In fact, shadow IT is rendering obsolete IT’s influence on choice of solutions. IT organizations that are embracing the choices their business counterparts are making remain in significant control of their own destiny. These IT leaders are changing the way that they approach the problem. 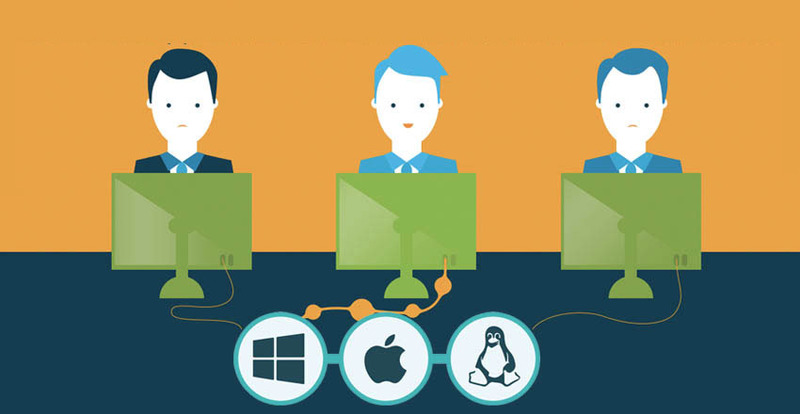 IT management tools and infrastructure need to be cross platform and heterogeneous. Modern IT management solutions need to treat cloud IT resources just as they used to treat on-prem. In short, there is no longer a distinction between platform, provider, or location. Nowhere is this more significant than with one of the most critical and core IT systems within an organization – their directory service. The central user management platform for an organization controls access to all of the various IT resources whether they are Mac laptops, AWS cloud servers, web applications, and beyond. Historically, the identity management problem was solved via Active Directory, which made sense in a homogeneous world based on Windows. Today’s heterogeneous infrastructure requires a new era of solution. Cloud identity management solution Directory-as-a-Service® is taking on this challenge and securely connecting user identities to the IT resources they need. This not only includes their systems (Windows, Mac, and Linux), but also applications (cloud and on-prem), and networks (wired and WiFi). IT admins can centrally control user access across a wide variety of IT resources whether they are in the cloud or on-prem. 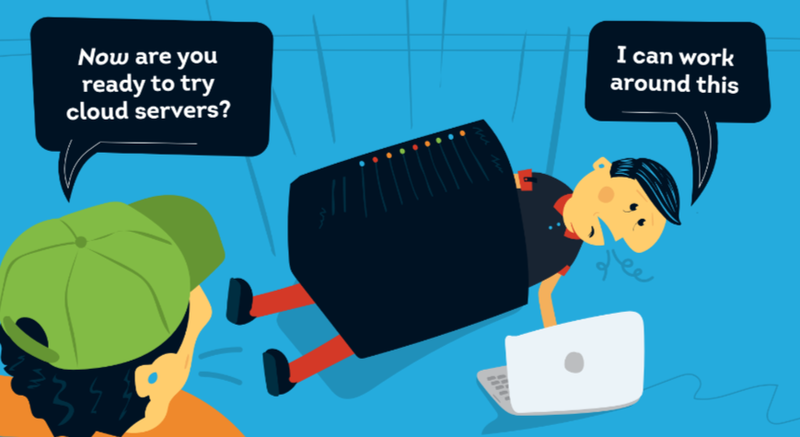 This infographic shows how a cloud identity management platform helps IT teams to instantly connect their users to IT resources across the world. The future of IT is here. It’s just not Microsoft. If you would like to learn more about how Directory-as-a-Service can unshackle you from the Microsoft ball and chain, drop us a note. Alternatively, sign up for a free account and check out our cloud identity management solution for yourself. Your first 10 users are free forever.